Many came on their own, many were brought -- but still, there weren't too many around on Sunday, January 11, at Sriperumbudur to hear Sonia Gandhi. Just a 12,000-odd crowd, unimpressive by any standards but more so considering that it was the Congress's mega-show, its magnum opus. The woman over there, yes, she who's staring at the podium so intently, she is from Vandaloor. She can't, just can't, take her eyes off the duo on stage. "No, I don't know madam's name. They did not tell me that, just brought us down here," she tells me breathlessly in Tamil, "Seeing madam is such a satisfying experience -- she is so fair and queen-like. Who is the girl sitting next to her? You mean that beautiful girl is her daughter? Oh, she is so beautiful! I think I'll vote for her." 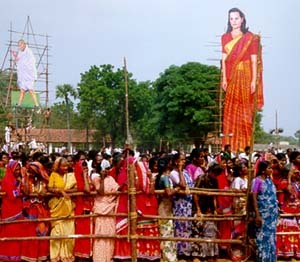 All around, cries of amma and thaye (mother) render the air while Sonia and Priyanka, both calm, collected and matter-of-fact, stand surrounded by this teeming mass of humanity. The woman from Vandaloor is still gushing about the 'tomato-red' skin of the mother and daughter. Nearby, another group -- probably 'brought' from somewhere -- are least bothered about what is happening and manages a snooze. I make my way through the crowd till I spot another lady who is ready to talk. This is Junamma. Her association with the Congress started 'long, long ago'. But the chord was severed after Rajiv Gandhi's assassination. 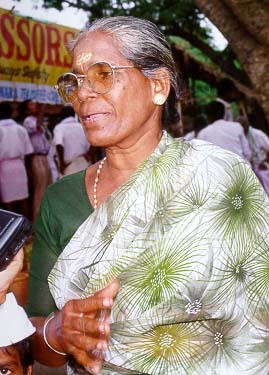 Sonia's decision to campaign prompted her to return to the Congress. "I was willing to die for the party once. Whenever I was a trouble it was the Congress which bailed me out. All that was during amma's (Indira Gandhi's) time," she says. The present leaders, she continues, are so corrupt that even a die-hard worker like her feels alienated. They are interested in only making money for themselves and don't care a damn about poor people. "I have 200 per cent trust in Sonia Gandhi. They are our royal family and they are very rich. Do you think they need more money? Those who live in the midst of wealth will never rob the poor," she reasons, "Let this amma lead us first. Then I am sure her daughter will lead us. Only this family can rule us, nobody else. They are born to rule us!" Rujamani, another Nehru-Gandhi family loyalist who came down from Erode, agrees. For her, this is a 'magic' moment, an 'emotional' one, one which she is going to 'cherish'. "Seven years!" she sighs, "But I never expected to see her daughter. She looks so much like Indira Gandhi that I feel like crying. Only this family can help us. Indira Gandhi was like a goddess and she blessed us like a goddess. Once Sonia becomes our prime minister, corruption will disappear, the price of rice will come down and the life of the poor will better." Earlier while coming in, I had a strange experience: I have heard about politicians being mobbed by journalists, but it was the other way round. As we squeezed through the barricade, khadi-clad Congressmen stopped us. They wanted us to write about Sonia in BIG letters. "This is going to be the most important event in Indian history. Sonia Gandhi should take over the party leadership and then be our prime minister. Only she can save our country from disintegration," they told us. "Who says she is a foreigner? She is not," the session went on, "The moment she was our dear Rajiv Gandhi's wife, she became an Indian. She is as Indian as all of us. She will be our prime minister till our sister Priyanka is ready to take over. Why do you have any doubt about the credentials of the family? This is our royal family. Only they can rule our country in prosperity. Can you name a single leader who is at par with Sonia Gandhi? She is our queen and we will worship her." I am roaming the crowd again, and I come across people of my trade, people who have come all the way from Italy. Sonia might be an Indian, she might be a queen, she might be everything to the Congress workers; but to the Italians she is still an Italian. And they have come fully equipped to picturise the 'emotional moment' when Sonia stands at the place where her husband was brutally assassinated. 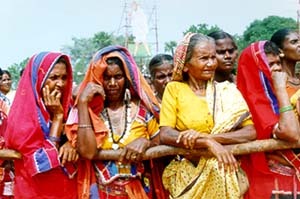 Douiela Beeg from the Italian women's magazine Doli Rejuheico is intrigued at the Indian-ness that Sonia is projecting. "It is a great human interest story for us," she says, "Can she really be an Indian like all of you? By wearing an Indian dress, can you change your identity? We are looking into that angle." 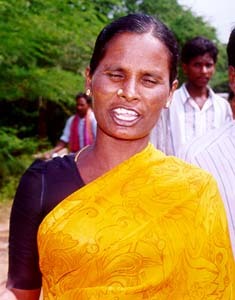 Beeg says many of her countrymen feel that Sonia stands a good chance of becoming the prime minister. "We also feel this is a launching pad for her daughter. Italians do not know much about her children. They are not interested either," she says, "They are only interested in her story." "We call her Cindrella back home. We call her story a love story, a blood story and a sad story. Real opera material," Ettore says, "India is such a far country to Italians. And suddenly they find that an Italian has a chance to lead it. Naturally, their curiosity is kindled. They see her as an Italian only, definitely not as an Indian. How can she be an Indian just because she is married to a rich Indian prince?" "Do you know," Ettore continues, "these days Italian papers are after her parents, sister and old teachers. Her school teachers remembered, rather surprisingly, that she was just an average student. Italians are interested only in her, not in Indian politics." 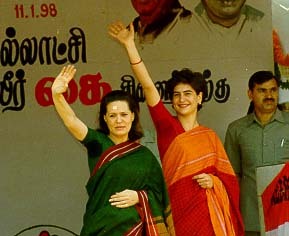 What brings The Independent's Delhi correspondent Peter Pophar to Sriperumbudur is Sonia's association with the Gandhis. "She is the widow of the Gandhi family. That's what interests us," he says, "People (in England) know about the family very well. And a name like Sonia Gandhi strikes an instant chord."